AS the date for the February 2019 presidential and national assembly elections draw closer, it is now clear that some prominent members of the red chamber of the national assembly will not be returning back to the senate after the expiration of the current assembly in June. The final confirmation of the end of their stay in the upper chamber came when the Independent National Electoral Commission (INEC) released what it call the final list of national assembly candidates for the 2019 general elections. While a little more than 60 senators who made INEC’s list of national assembly contenders have chances of being part of the 9th assembly as they will now slug it out with their opponents on February 16, more than 40 of their colleagues have no hope of ever being part of the next senate as their names are not on the list of those that will be participating in the nationwide elections that will produce members of the 9th assembly. The affected senators will not be contesting the 2019 elections for various reasons. While a number of them voluntarily decided to ‘retire’ from the senate and allow others take their place, there are those who opted to seek the governorship tickets of their various parties in their various states. While some succeeded and are now guber candidates, others failed in their bid and will not be competing in the elections altogether. There are also some of the senators who lost their seats to the senatorial ambitions of their state governors. As a result of the loss of senators in this categories, seven serving governors now have the possibilities of joining others as senators when the next assembly is inaugurated. Among serving governors now seeking senate seats are Ibikunle Amosun of Ogun state and Rochas Okorocha of Imo state. Others include Abiola Ajimobi of Oyo state, Kashim Shettima of Bornu state, Ibrahim Dankwabo of Gombe, Abdulfatah Ahmed of Kwara state and Ibrahim Geidam of Yobe state. While a few of these governors emerged as the candidates of their respective parties through peaceful consensus arrangements that saw the incumbents stepping down for them, others had to wage fierce political wars against erstwhile political associates to pick the tickets. Among current senators who decided they have had enough of the national assembly is former senate President and the indisputable longest serving senator in the country today, Senator David Mark. The Peoples Democratic Party (PDP) senator represents Benue South senatorial district of Benue state in the national assembly. He is currently serving his fifth term as a senator having been first elected in 1999. Mark, who was elected Senate President in and remained in that position till 2015 when his party, the PDP could not win enough seat in the upper chamber to be in the majority and had to cede the seat to the ruling All Progressives Congress (APC). Although he remained a respected member of the chamber, not much was heard of his since the inception of the 8th assembly. Comrade Abba Moro, a former Interior Minister, is the candidate of the PDP in the district for the next election. Similarly, Senator Jonah Jang (PDP Plateau North), who is also a former governor of Plateau state, has willingly decided that he will not be returning to the senate after just a term in the chamber. The PDP senator, according to sources close to him, considered running for the presidential ticket of his party but later jettison the idea. He may have decided to retire from gunning for elective positions even. Senators Shaaba Lafiagi (PDP Kwara North) and Demola Adeleke (PDP Osun West), are two other legislators who didn’t bother to seek the ticket of their party for re-election into the national assembly. While it was gathered that Lafiagi, a former governor of Kwara state decided to rest on account of old age, Adeleke may have been forced to jettison a return to the senate by an ongoing trial bothering on alleged examination malpractices. There are also Senators Ahmed Sani (APC Zamfara East), Bukar Abba Ibrahim (APC Yobe East) and Kaka Gabbai (APC Borno Central), who voluntarily opted out of the race to allow their state governors take their seat at the senate in the 9th assembly. While Governor Abdulazeez Yari is still battling in the courts to get his name into the INEC list, Governors Geidam and Shettima are now slated by INEC to battle other candidates for senate seats. Featuring prominently among senators that will not be returning to the national assembly as members of the 9th senate are those who decided to gun for the governorship seats in their various states. 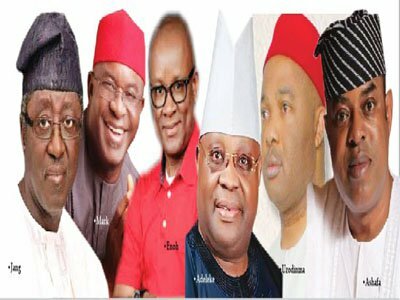 Following the various primary elections of political parties across the country, while some of them are now flying the banners of their parties as guber candidates, others let out in the race. Senators Jeremiah Useni (PDP Plateau South ) and Abdulaziz Murtala Nyako (ADC Adamawa Central) are two senators who made it into INEC’s list of governorship candidates. As such, the duo will not be returning to the national assembly in 2019. While Useni is now the gubernatorial candidate of the opposition PDP in Plateau state, Nyako, son of a former governor, is flying the banner of the African Democratic Congress (ADC) in the Adamawa state governorship race. Similarly, Senators Usman Bayero Nafada (PDP Gombe North) and Hope Uzodinma (APC Imo West) were successful in their quest for the governorship tickets of the PDP and APC respectively in their homes states of Gombe and Imo. The duo will not be rerunning to the senate for now. While Nafada emerged as the choice of Governor Dankwambo in Gombe, Uzodinma waged, and is still waging the political battle of his life with Governor Okorocha to clinch the guber ticket. Senator John Enoh (APC Cross River Central) is another member of the national assembly that will not return for the 9th senate. He sought the governorship ticket oft eh APC in his home state of Cross Rivers and made it to the final list of INEC although his candidature is strongly being challenged by another chieftain of the party in the state. Safe for an unfavorable court judgement, Enoh currently looks good to contest the guber polls. Not all the senators willingly surrendered their tickets to the contenders who replaced them. Many of them put up fierce resistance even when it was obvious that they forces against their reelection into the senate were formidable. But in spite of their struggle to wade off opposition to their candidacies, a good number of the senators lost at the various primary elections of their parties. Good examples are Senators Gbenga Ashafa (APC Lagos East), Lanre Tejuoso (APC Ogun Central), Fatima Raji Rasaki (APC Ekiti Central), Sola Adeyeye (APC Osun Central) and Babajide Omoworare (APC Osun East). Ashafa was trounced by Hon. Bayo Osinowo, a ranking member of the Lagos State House of Assembly (LAHA) while Rasaki lost the APC ticket to former House of Reps member, Opeyemi Bamidele. In Osuns state, both Senators Adeyeye, current chief whip of the senate, and Omoworare, could not convince their constituents to allow them return to the senate for another term. Rather, members of the APC in Osun central and Osun East rejected their re-election bids and instead gave the party’s tickets to Commissioner for Justice and Attorney General of Osun State, Dr. Ajibola Basiru and Ajibola Famurewa, director-general of the campaign of Governor Gboyega Oyetola. Senators Aliyu Sabi (Niger North) and David Umaru (Niger East) will also not be returning to the senate largely because Governor Sani Bello fought vehemently against their re-election. While the duo gave good account of them in the struggle for the tickets of the ruling APC in the state during the primary elections, the political structure of the governor across the state ensured they both lost at the primaries. Others national assembly members who couldn’t suppress oppositions to their re-election during the primary elections and had to surrender their party’s tickets to other people include Senators Gilbert Nnaji (PDP Enugu East), Emmanuel Paulker (PDP Bayelsa Central), Ben Murray Bruce (PDP Bayelsa West), Fosta Ogola (PDP Bayelsa South) and Ahmed Abubakar (APC Adamawa South). In a bizarre twist in the race towards the 9th senate, some senators have been locked out of the struggle by INEC due to certain technicalities. And unless something unforeseen happens, all the senators representing Zanfara and Rivers states in the national assembly may remain automatically disqualified from returning to the upper chamber after the general elections. In the final list released by the commission, no candidates were listed for the APC in Rivers and Zamfara states. Earlier, INEC had said it would not allow the APC field candidates in Zamfara because the party did not hold primaries within the stipulated time. Infighting and disagreements among leaders of the party in the state led to the inability to hold the primaries within the stipulated time. Two separate courts in Abuja and Zamfara recently gave conflicting judgements on INEC’s insistence that the party cannot field candidates in the state. While the court in Abuja said the commission acted right, another one in Gusau ruled that the APC did conduct primaries and INEC should ensure the party presents candidates for the general elections. The electoral commission, after all said and done, chose to abide by the judgement of the Abuja court. In Rivers, the same scenario played out among party leaders, leading to the inability of the party to conduct acceptable primary elections to all the factions and the INEC. The party is divided into two factions loyal to the transport minister, Rotimi Amaechi, and Senator Magnus Abe respectively. The commission say based on an high court ruling, it will not recognize any of the two factions. Rather than resolve the differences and hold primary elections joint within stipulated time, the infighting continued. What followed is a litany of court cases. Recently, a federal high court recently ruled that the APC disobeyed a high court order on its congresses and so the primaries that produced its candidates were null and void. Thus, the three senators in the state will not be returning to the chamber if the situation remains the same till February 16.